It is not easy to fight against the mainstream media propaganda. Google and Facebook are tightening their censorship controls. So our weekly newsletter remains the best way of keeping in touch. But also here the tech giants, or perhaps those evil Russian hackers, are putting up roadblocks. Our newsletters end up marked as spam. Our servers are often blocked. To avoid these problems in the future, our tech team had to restore our database. From now on, in order to keep following us without interruption, we need a little action from your part. Have you subscribed to the newsletter? Make sure that your registration is valid by following this link. Simply click here and introduce your email address. You will immediately receive an email asking for confirmation. If you do not receive this confirmation email try checking your spam folder. Why is it important to subscribe to our newsletter? We could go on. The amount of effort dedicated to have us swallow these bitter pills shows how control over information is essential for those who hold power. But the system is in crisis and the Internet has opened a new front in the information battle. That is why these days, under the cover of the fight against fake news, censorship is gathering pace. Nevertheless, the repeated crisis demonstrate that opening up the debate is essential in order to build alternatives to this economic model that worsens inequality, leads to war and devastates nature. And we know there is no room for such a debate in the mainstream media. The alternative media thus play a crucial role. The Investig’Action newsletter is the best antidote against the mainstream media propaganda. Be sure to take your weekly dose, it is free and has no ads. By registering you will be safe from the increasing censorship of the Google and Facebook algorithms. You will receive our articles, videos and conference announcements. You can also reply and send us your questions, suggestions and complaints. 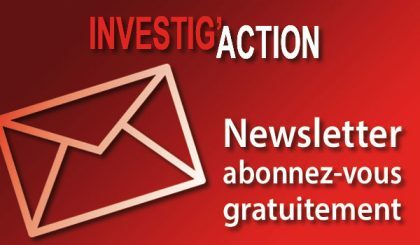 In short, the Investig’Action newsletter is the best way to keep in touch and organise ourselves in this information battle.